Mark and I were determined to make it to Cartagena, Colombia, by Christmas and therefore felt pretty much on the move and focused since leaving the out islands of Venezuela in November. The reason for making Cartagena harbor before the end of the year was two-folded: the Colombian coast is known for its heavy weather and nasty storms once mid-December comes around, with fewer and shorter opportunities to sail after that, and many cruisers had told us Cartagena is the most magical and fun place to be for Christmas. Even though the sailing trips were fairly slow most of the time (we really missed not having a spinnaker; heavy winds off Colombia? Hard to imagine…), Irie made it to Cartagena on December 15th. Right in time, based on the gale force winds that battered the Colombian Coast for weeks to come, two days later. The old town was pleasant and beautiful, with a little bit of a Christmas atmosphere in the streets: some squares were lit up and certain areas had colorfully lit statues; locals were doing last-minute shopping in the busy stores. Santa Marta, however, seemed more bustling, especially in the evenings, and the Christmas spirit there was ever-present. The thing that put us off most about having a “Christmas in Cartagena” was the annoying, busy and filthy anchorage. Basically from the moment we arrived, we couldn’t wait to leave again, apart from the old town’s appeal. We couldn’t imagine sitting there another weekend – Christmas weekend of all times! 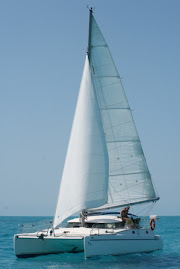 – getting tossed around in our pitching catamaran while local families and commercial captains would buzz around the harbor, creating massive wake, all day long. Together with a bunch of other cruisers (Why didn’t they all stay in Cartagena for its splendid Christmas? ), we moved to a big and pretty mangrove anchorage called Cholon, about 16 miles south of Cartagena. Lack of wind had us motor most of the four hours and researched waypoints helped us through the tricky entrance into the lagoon. Ex-cruisers Robert and Carmen, who own the refitted Venezuelan fishing boat Manatee, invited all cruisers in the area to their house for a potluck Christmas dinner. They provided the space, a turkey and the trimmings, while the guests brought a side dish, their drinks and a “treasures of the bilge” object they couldn’t use aboard anymore as a gift. On Christmas Eve, a group of cruisers went caroling around the harbor. It prompted us to decorate our cockpit – and ourselves - a bit. We almost forgot it was Christmas, having arrived in Cholon only an hour or so before! Around 30 people gathered in the house on the hill that Christmas Day. The atmosphere was festive with Christmas decorations present in details like ear rings and clothes, wonderful dishes stalled out on a big table, kids playing around, cruisers socializing and the view over Cholon with lush islands dotting the lagoon was marvelous. The scrumptious food was a highlight, of course, and everybody had done their best to provide something special. Mark and I spent the whole morning making enough tostones and complementary sauce for an army. Whoever brought a gift was able to pick a wrapped gift or an already opened gift and a lot of laughter was had. We all had an interesting and tasty afternoon and appreciate Robert and Carmen’s hospitality to host this Christmas event in their “Crow’s Nest”! View of Cholon and all the cruising boats from Robert's place "Crow's Nest". The entrance to Cholon is a bit tricky - you have to pass very close by these palapas. A bunch of cruisers caroling on Christmas Eve. A couple of picturesque islands dotting the area around Irie.